Audite’s fifth volume of the Complete Beethoven String Quartets presents not only the Op.132 String Quartet but also Beethoven’s only original String Quintet. 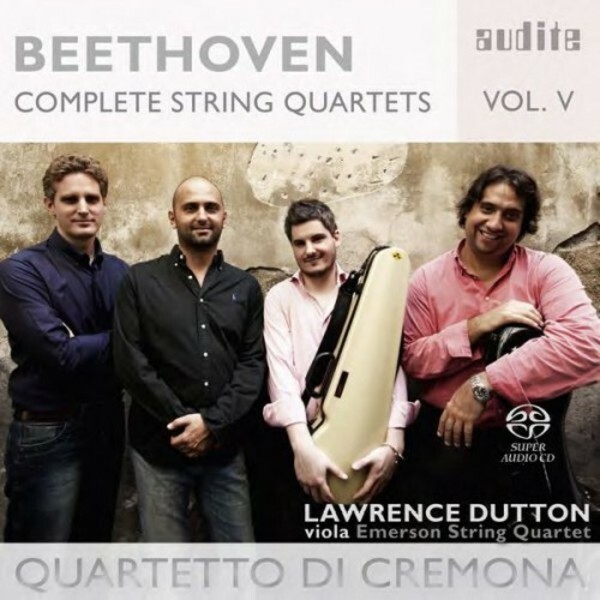 Lawrence Dutton, the viola player of the Emerson String Quartet, joins the Quartetto di Cremona. Mozart left six string quintets to the music world, Louis Spohr’s work catalogue contains seven, whilst Luigi Boccherini completed around 120. Beethoven had three quintets published, but only one of these was originally conceived for string quintet. However, his opus 29 of 1801 is a true masterwork on the brink between the Classical style of his teacher, Joseph Haydn, and the revolutionary idiom of Beethoven’s middle and late periods. The Adagio (with its adjunct of 'molto espressivo') in particular heralds an evocative intensity which was still foreign in Beethoven’s earlier works. However, by his late oeuvre of the 1820s – the Ninth Symphony, 'Missa solemnis', late piano sonatas and quartets – Beethoven had developed such a distinctive language that the label of 'Early Romanticism' no longer applies. His String Quartet in A minor, Op.132, with its five movements and exceptional degree of difficulty, also stands apart from contemporary works - then as now, only professional ensembles could tackle this grandly conceived colossus. As in the quintet, the Molto adagio represents the core of the piece. Its title – 'Holy song of thanksgiving of a convalescent to the Deity' – refers to an illness from which the composer had recovered, and adapts a chant inspired by the Renaissance composer Palestrina. In so doing, Beethoven includes a musical ancestor in his quartet whilst making a religious avowal.